For those MacBook Pro owners with higher end models that include dual video cards (integrated and discrete GPU), you’re likely aware that Mac OS and certain apps will switch between the two graphics cards as is determined necessary. The idea behind this is for apps to use the integrated GPU when attempting to conserve power and battery life, and to use the discrete GPU when attempting to maximize graphics performance at the expense of battery and increased power consumption. 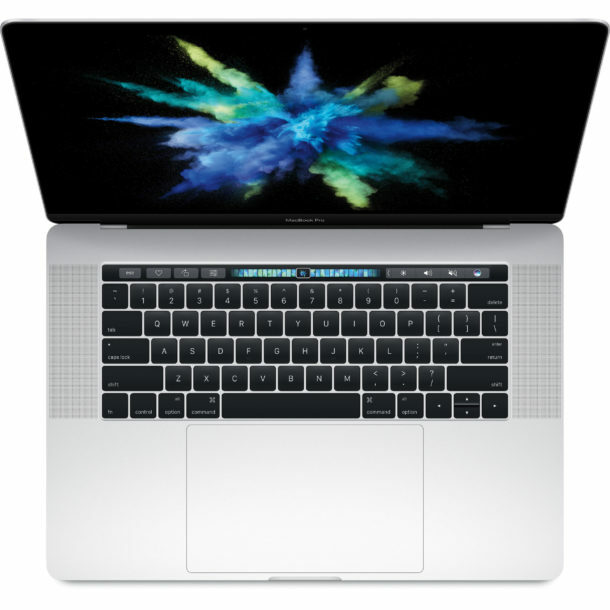 Generally speaking GPU switching is a great feature that should not be modified or adjusted in any way, but some advanced Mac users may wish to disable the automatic graphics card switching feature on MacBook Pro models. Note that by disabling GPU switching, you will always use the discrete higher performance graphics card, which uses more energy. 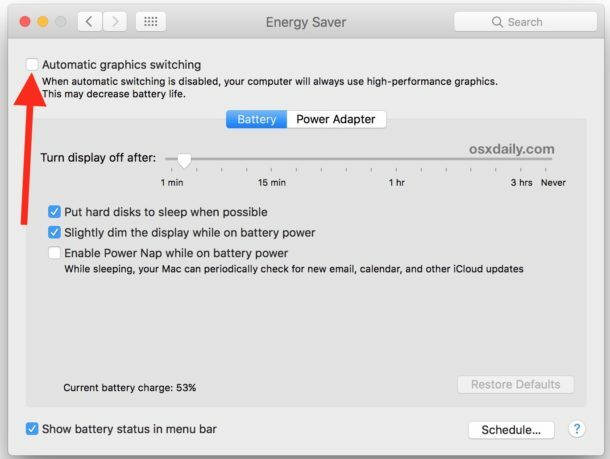 This may lead to better performance but it will almost certainly impact battery life on the MacBook Pro as well. This will disable GPU switching and force the MacBook Pro to use the higher powered discrete graphics card rather than the integrated GPU. You can always return to the Energy preference panel to re-enable the GPU switching feature if desired. For MacBook Pro users who want to manually control their GPU use, you can use a third party tool like GFXCardStatus which has been around for quite some time and still works on most modern MacBook Pro models as well. As mentioned earlier, most MacBook Pro users will not need to adjust this setting and should not adjust this setting, instead letting Mac OS determine what apps should use what GPU as necessary. Rarely, if you discover some game is not properly triggering the GPU switch, you can turn the feature off to force the discrete graphics card to be active instead. That’s usually the result of a bug in the particular game or app, so updating the app first would be a good idea to see if that allows the game to use the intended GPU. If you are toggling this setting for gaming performance reasons, you might also want to use this trick to improve game performance on MacBook with Retina displays too, which uses lower resolution but can dramatically boost frame rate. Yeah there is an app GFXcardStatus, it’s only a temporary fix the only fix you need to take your macbook Pro to apple support. The fork is no longer maintained. I guess it’s my mistake. My 2015 15″ MBP Retina appears to only have integrated IRIS Pro graphics. Is there a way to alter these settings in a different way with the same objective then? This is what I was advised to do for a malfunctioning game prior to sending a report. It’s not on Yosemite (10.10.4) either. The Mac motto of telling users how to use their computers. Unless your one of the people (like I am) that are suffering from the MBP GPU Panic (Mid-2010 model), this helps a lot. Thank you so much for this information. I was searching this question but couldn’t find. You helped me a lot. Thanks once again. I’ve tried this with my maxed out late 2012 MBPr and the settings never stick. Especially after a restart or shut down and start up. Late 2011 MacBook Pro 17″ with the same graphics card issues. Just took mine apart and heated up the AMD discrete GPU with a heat gun for 5 minutes and popped it all back together and ~voila~ it works now. Installed the gfxCardStatus from a few different sources because mine wouldn’t stay on Integrated Only like it should. Finally found this fork from a contributor that works great! He set the default to Integrated Only on opening, rather than Dynamic Switching. You probably have to change your security settings to run it – FYI. If you are having these same issues, don’t use external monitors, and limit graphics heavy tasks. gfxCardStatus recommends not using Chrome, but I will probably use it anyway. Hi Cody, how do you get the MBP to boot up in integrated mode? Since I can’t see my screen and can only control it via Screen Sharing or AirPlay, the integrated selection doesn’t stick and app returns to dynamic mode. Am I missing something?